Washington, D.C. - The Department of Homeland Security launched their new emergency preparedness "READY Business" web site on Thursday, September 23, 2004, to a group of 200+ businessmen and women at the U. S. Chamber of Commerce. 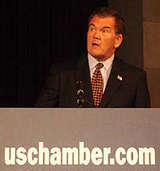 Among the select guests, was US Life Safety's President Steve Burchesky. The aim of the new government web site is an emphasis for all business owners to take a more proactive approach for their employees by being prepared for any emergency. 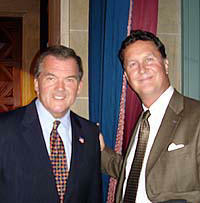 Burchesky was of course delighted to see this effort by Homeland Security as this is what US Life Safety is all about. Talking with Co-workers with Disabilities, Emergency Supplies, Planning on whether or not to "stay" or "go", Making Fire Safety Part of the Plan, and Continuity Planning. Complementing the guidelines in the "READY Business" site, could be US Life Safety's new "Life-Counts ®" emergency management tool that would enable business' to quickly and easily distribute their emergency and continuity plans (and floor plans) via a secure web service. 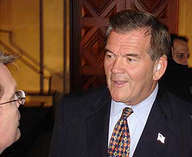 and Secretary, Homeland Security, Tom Ridge. Among its many unique features, "Life-Counts ®" would allow emergency management to track; those who have seen the plans, those who have not seen the plans, and how well those plans are understood. "Life-Counts ®" also features an easy communication network system for over ten select employee groups including those who need Special Assistance, those who are on the Emergency Response Team, or those who are certified in AED, 1st Aid, or CPR training. US Life Safety, Inc. feels that by implementing "Life-Counts ®" with emergency or contingency plans, a business can greatly reduce risks, liability, and possibly even insurance premiums.